PA “foreign minister” asks UN Human Rights Council to take practical steps to protect the two-state solution. Riyad al-Maliki, the Palestinian Authority’s (PA) “foreign minister”, on Tuesday asked the UN Human Rights Council to take practical steps to protect the two-state solution. His request includes action to ensure justice for the Palestinian people, the realization of its rights to self-determination, independence in a Palestinian state with Jerusalem as its capital, and implementation of the “right of return” of refugees to homes from which they were expelled in accordance with UN Resolution 194. Maliki presented his request in a speech at the UN Human Rights Council headquarters in Geneva, in which he also called on the council to implement the Geneva Convention on the "Occupied State of Palestine, including in East Al-Quds" and to provide international protection to the Palestinian people. He claimed that Israel, which he called the "occupying authority," continues to enjoy immunity and evade punishment for its "crimes" despite a long list of resolutions against it at the UN. Maliki called the Israeli "occupation" “illegal and colonialist" and "racist" as reflected in 180 "racist" laws approved by the Knesset. 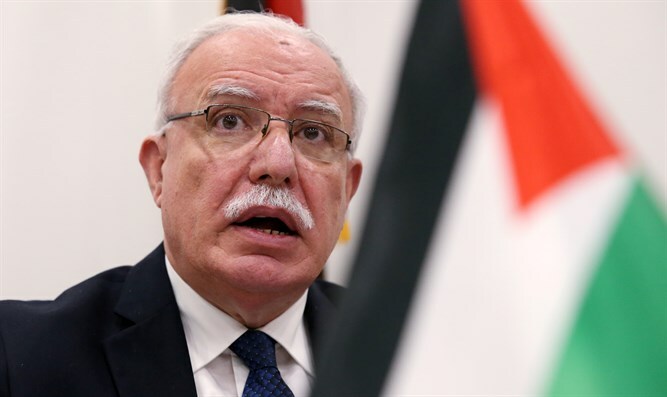 The PA official condemned Israel’s decision to offset tax revenues that Israel transfers to the Palestinian Authority in accordance with the sums of money transferred by the Palestinian Authority to terrorists and their families. He called "the families of the shaheeds and political prisoners who were arbitrarily arrested" the "most important" layer of Palestinian society. The UN Human Rights Council (UNHRC) is notorious for its anti-Israel bias. Last year, the US withdrew from the UNHRC due to this fact. Israel followed by reducing its participation at the Council. This was made possible after the UN General Assembly overwhelmingly approved the de facto recognition of the “state of Palestine” when it upgraded the PA’s UN observer status to non-member state in 2012.